Welcome to Episode 7 of the Sapphires-N-Purls podcast! In addition to what I have been up to lately, below are links to everything I talk about in this episode. I finally finished the dog sweater for my sister's friend! I will be putting it in the mail this weekend. I'm pretty pleased with how it turned out. I didn't use a pattern, I just kind of winged it, and sure hope it fits! 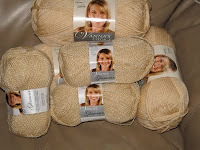 I also picked up some yarn for the Vanna's Choice Contest I talked about in the last episode. I haven't quite decided exactly what I want to do yet, but have been playing around a little bit trying to get a feel for the yarn, what kinds of stitches look best, etc. 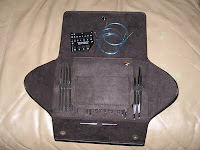 I also got my Addi Clicks!!!! Woo-hoo!! As you may know, the going price for these is around $169 - $179. My LYS has them at the higher price. I'd been debating for a while now if I should spend the money or not. I was ready to order last week at the $169 price, when I just happened to see them at Paradise Fibers...... for only $159! What a steal! This price was for a limited time only, and they only had 18 left in stock. So I ordered of course. That was Sunday. They arrived on Wednesday and were just waiting for me to get home from work! Talk about fast shipping! Had I waited, I could have had them for only $149. Yes, that's right, they are now available from Paradise Fibers for only $149!! If you are in the market for this set, I'd recommend picking them up now while the price is so low. Even at $159, I'm so excited to finally have them I can't even tell you. They are so much better than the Boye set I got a few years back. So, here they are, in all their glory. I also made a little trip to a yarn store called Natural Stitches. This store is located in Pittsburgh, PA and is fabulous! This is a bit out of my way, but I'm happy I made the trip. I had planned to take some pictures while there, but forgot. If you are in the area, I recommend dropping by this store. They have an amazing selection of yarn, fiber, needles, and spinning supplies. I bought some yarn for my sister to make a shrug, and picked up a couple of skeins of Cascade 220 for myself to make mittens. 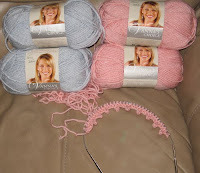 I also got some blocking wires, which I have no clue how to use but am anxious to learn! I can't wait to go back here, I can't tell you what an awesome yarn selection they have! You must go here! You will be glad you did, I promise! Provides support to mariners around the world. Contact them for more details about how you can donate knitted items. Provides hats, blankets, booties, etc. for premature babies. Join the craft forum to access free patterns. Provides security blankets for shelter animals. Free patterns available if you aren't sure what to make. I am working on the Springy Ring Mittens, using Mini Mochi Yarn and the free pattern from Crystal Palace. The movie I will be watching this week is Queen Bee , starring Joan Crawford. This is from 1955 and is a great old black and white. One of my most favorites! She is truly wicked in this movie and proves that karma really does come back to bite you! 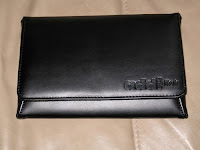 Available from amazon.com, or if you have AppleTV, or iTunes you may get it from there, and it is cheaper than amazon. Of course, you don't have to watch this particular movie, or any movie at all. Just set aside at least one night a week for yourself and your knitting. Here is what I have so far. 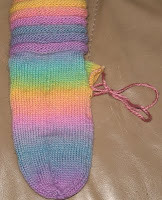 I just need to finish the thumb on the first mitten, and then I will begin working on the second! In the next episode I will reveal the first part of the second Mystery Knitting Project, plus more magazine reviews, links, and all things knitting. Until then, Happy Knitting!